KickoffLabs is a great platform for collecting leads and running viral contests. We make it easy to setup refer a friend style contests, giveaways, sweepstakes, and product launches. 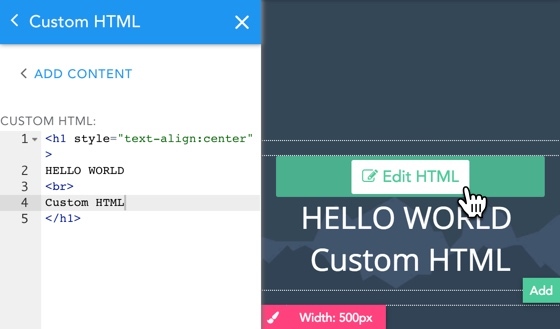 You can build out amazing marketing experiences with our script platform and developer APIs. We have some best practices outlines here that teach you how based on your goals. In this case you just want to add a little bit of flair beyond what what you can control in our designer. Read our complete guide to this here. You may not need to develop your own page or use our API directly. Ex: Using the custom HTML block. We get it. No landing page template does your brand justice. You are a designer or developer that likes to write their own HTML and connect that page and form to a contest platform like ours. You may already have a site built or have purchased a template you want to use instead. You build the HTML with a form on it. 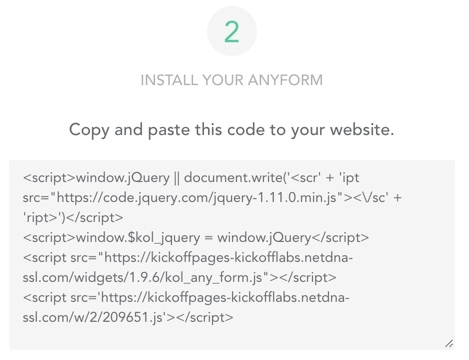 You generate the AnyForm Script for your campaign within KickoffLabs. You paste that script onto your custom page. When someone submits that form you redirect them to a page that encourages sharing. In most cases people choose to use a KickoffLabs hosted page like https://thanks.YourWebSiteDomainHere.com. Click here to learn how to generate the AnyForm Script for your campaign. 90% of the time this is what you probably want to do if you are here. If you need something more custom then keep reading below about our API. The AnyForm Script ready to install. When a lead signs up we can make an HTTP Post to the URLs you specify for your campaign. The body of the post will have all of the parameters specified in our API documentation here. Learn how to setup WebHook targets for your campaign. You may not need to develop your own page or use our API directly. It's also possible to use the KickoffLabs API directly. You can add leads to your campaign, check a leads status to build your own reward pages, and tag leads as well to assign custom points for your contest. Open a campaign in KickoffLabs. Click campaign settings in the left nav. Scroll down to "Other Settings" and choose "API Access". Turn on the API and copy the ID and API key you see. Read below for API endpoints. You need the campaign ID and API key. Supplying these values will help us better categorize your leads and prevent fraudelent/spam leads from adversely affecting your campaign. __url: The URL which the lead signed up on. __ref: The referrer url the lead came from. __user_agent: The user agent of the lead. your_custom_parameters: This allows you to store additional data with each user. Please do not start any parameter name with a '_'. This is useful to simply pull information about an existing subscriber. email: The email address used when signing up. social_id: The social id returned when the user signed up. This is the value used to track social sharing. You can also optionally include an api_key parameter (found in your KickoffLabs dashboard). When this is present, the response will include a users custom fields. Response - The same for both endpoints! url - this is the url of the landing page. social_url - this the url for the KickoffLabs landing page with the social_id appended to it. parent_id - the social id who referred this user. This value maybe null. Keep on reading to find examples from Ruby to VB.NET. :) We also have a complete demo you can download. Please keep in mind that if you are building a custom form you should probably be using AnyForm. This is for example purposes only.